Why is sailing around Lesvos so special? 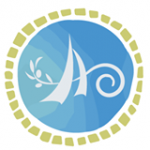 Sailing and Lesvos, just two words or two Worlds? They meet in Alternative Sailing. Read why sailing around Lesvos is a dream for the novice and expert alike and make your dreams come true. Walking and Biking around Molyvos is very popular. There is now another guide to help you get the most out of your stay. The guide has been produced by the Molyvos Tourist Association and is free of charge. 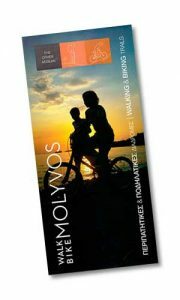 You can pick up the guide at the Molyvos Tourist Office. I am told that some hotels also have copies available. The routes link in with new signs that were put up in May of 2013 so it should make following the route very simple. 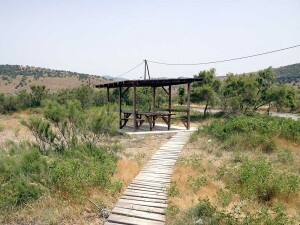 The guide will apeal to those used to the hidden paths and ways of Lesvos but will be most appreciated by those who have yet to discover the beauty that awaits just a few steps away from the main roads. The walks are graded so that you can start off with less strenouos routes and progess to the more taxing. Please let us know how you get on with your walks. “I am walking alone because I want to be alone” – Greta Garbo in The Single Standard (1929). If those words could be yours, then Kampos beach just might be the place for you. We visited the beach in late May and felt like we were the only people on the planet. As you can see in the picture opposite there is a small picnic area with some shade so that you can enjoy a snack out of the sun. That is the only facility available on the beach. There are no sunbeds, umbrellas, bars or tavernas. You will need to provide your own refreshments. The beach itself is mostly sandy and the water was beautiful and clear on the day that we visited. The winter storms had washed up some pieces of wood and the obligatory crop of empty water bottles. With nobody ‘managing’ the beach these are only going to be removed if visitors do the removing. In the hope that we will encourage you to follow suit, we picked up some plastic bottles and took them away. So why visit Kampos beach? Peace. Quiet. Getting away from civilisation. In this hectic overcrowded world it is nice to find your very own deserted corner. The beach is reached from the road to Gavathas. My advice is ignore the first “Kampos Beach” sign and continue on to the second signed turning. After about 500 metres the road drops into a dry concrete river bed. Follow the signs and follow the river for approximatly another 1000 metres. You have arrived. 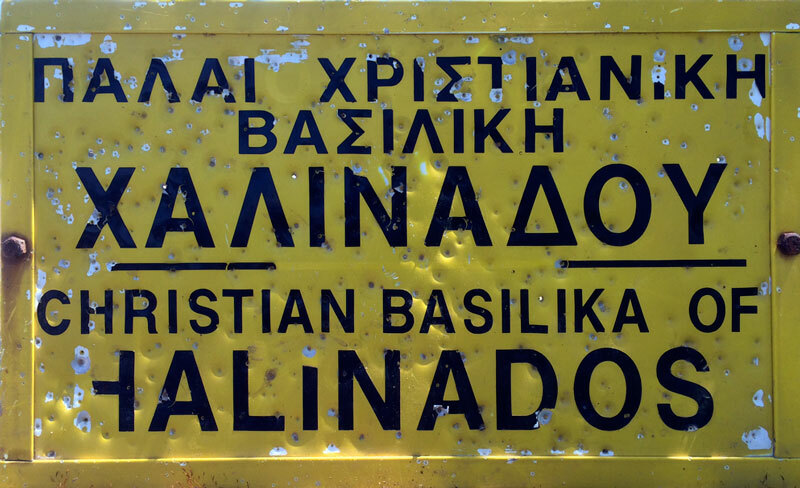 If you fancy eating in a ‘real’ Greek taverna then go back up the river to where you joined it and turn left. 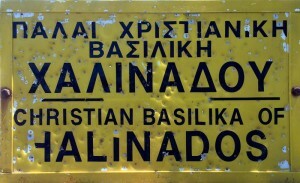 Immediately there is a taverna. We were invited to visit the kitchen in true Greek style to select our food. We had fantastic Kalamari with a Greek salad, stuffed courgette flowers and okra cooked slowly in the oven in oil with tomatoes. It was a beautiful meal finished with apricots which the owner picked from the tree outside the taverna for us. 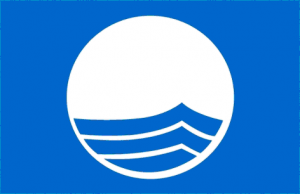 The Blue Flag beaches for 2013 have been announced by the Hellenic Society for the Protection of Nature (HSPN). Lesvos has 10 beaches that will fly the blue flag for the 2013 season. Many people are not aware that the Blue Flag Programme looks at many things, not just water quality. The more remote beaches around Greece will not get a blue flag because of the lack of organised services. It is this very aspect that makes them so appealing to many people, me included. Sitting on a deserted beach miles from civilization followed by a swim in the crystal clear Aegean Sea is one of life’s joys. The Blue Flag Beaches on Lesvos are worthy of note, but remember that they are by definition going to be ‘organised’ and more popular. Why not be Robinson Crusoe for a day on a beach a little more remote, more private, more ‘special’. You can read more about some of Lesvos’ less well publicised beaches in our Beautiful Lesvos Beaches section.